The clue-scouring gumshoe has always been a role masked in mystery and intrigue. Hardly a role for kids usually, mysterious detective tales filled with riddles and enigmas are designed to confound even the brightest observer. 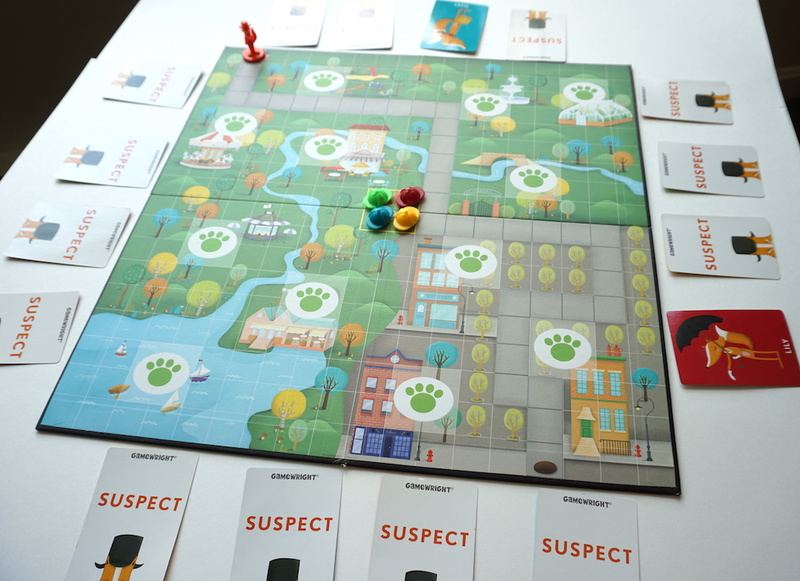 Enter Outfoxed, a lighthearted cooperative whodunit game from GameWright aimed squarely at a younger generation. Somebody stole Mrs Plumpert’s pot pie and it’s up to the team of young detectives to find out who it was before they get away! Is Outfoxed outstanding, or is it insipid? Let’s find out. In Outfoxed, players are tasked with identifying suspects and searching for clues on the board to determine which of the various foxes in play is guilty of stealing Mrs. Plumpert’s pie. While they’re gathering clues and finding foxes, the fox pawn travels down a path across the board. The whole team loses if the fox makes it to the other side before its found out! Game setup involves spreading the 16 suspect cards around the edges of the board and turning two face up; the known suspects. Then, the players choose one of the 16 thief cards randomly and insert it into the special clue decoder with the window closed. 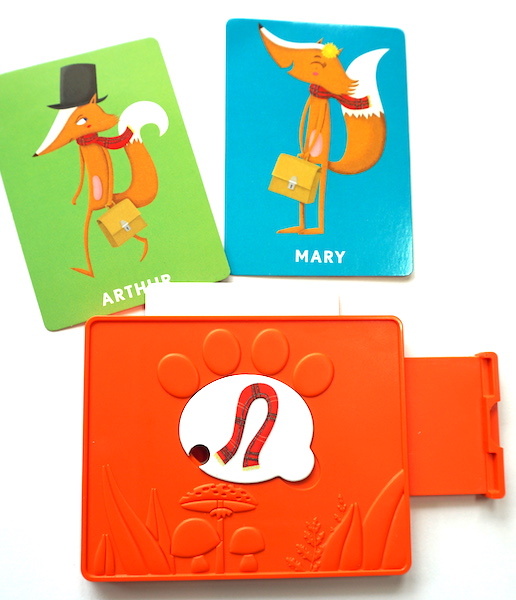 These thief cards give information about the various attributes of the guilty fox. 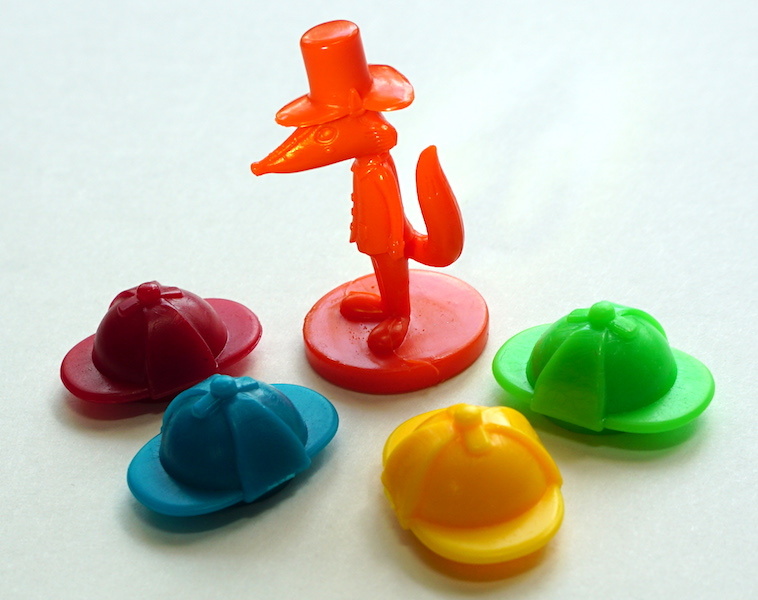 All players (represented by adorable little detective hat pawns) begin play in the square in the center of the board. 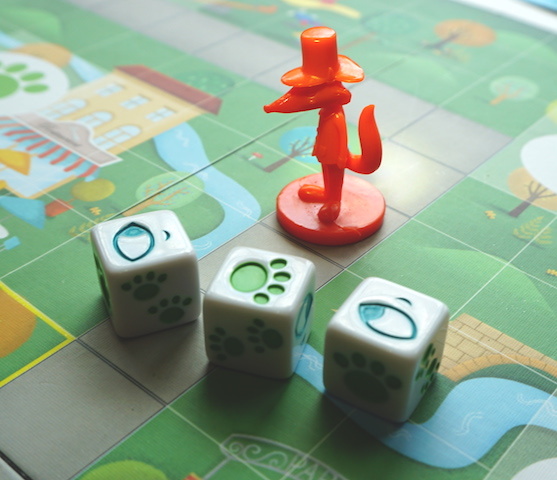 The fox token starts at the the start of the path, where the fox icon appears on the game board. On each players turn, the player declares their intent to “search for clues” or “reveal suspects”. They then roll three dice. 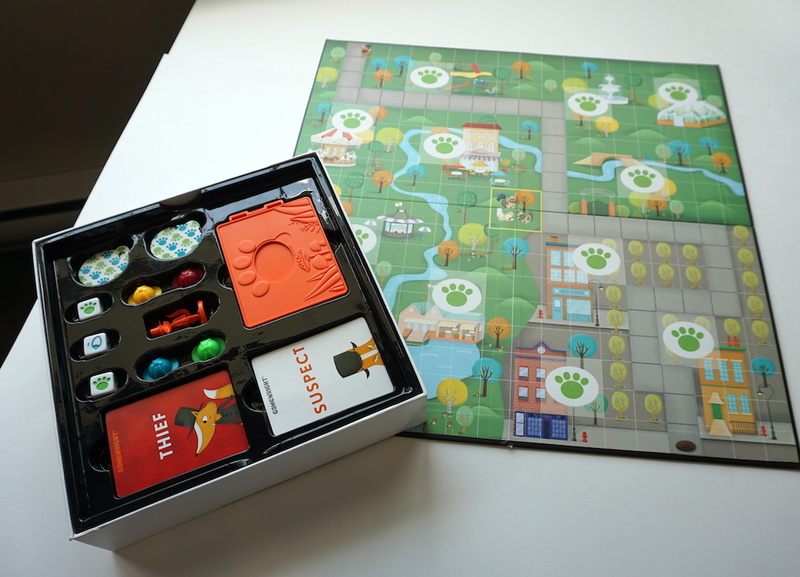 Players can roll the dice up to three times, and set aside dice that show the correct symbols for their goal that turn (paws for clues, eyes for suspects). If the player is not successful in getting all three dice to show the desired icon, the fox moves three spaces on his path! If the player is successful, however, they take an action. Should a player decide to reveal suspects, they choose two of the face down suspect cards surrounding the board, and turn them face up. If the detectives can remember the clues they’ve already revealed they can apply them to these new suspects. This allows them to immediately discard any suspects they know don’t match the clues they have. Otherwise, they remain around the board. If they are searching for clues, they count the paw prints on the dice and move that many squares. If they can reach a clue space on the board, they can take one of the oval clue bubbles. These clue bubbles show certain properties of the suspects (eyeglasses, hat, cane, etc). The player places the clue bubble in the clue decoder and open the window. If the notch reveals red, it means the thief has that attribute! If it is green, the thief does not. Once the players know this new attribute they discard suspects that do not match have it. The game ends when either there is only one remaining suspect (the thief! ), or if a player chooses to finger a suspect without every possible clue resolved. Should the accusation be incorrect, the fox escapes and everyone loses! However, if the accusation is correct, everyone wins! 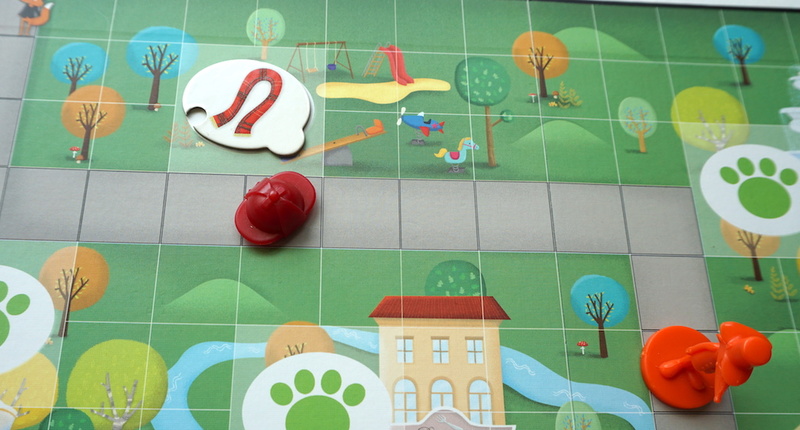 If the fox makes it all the way to the other end of the board during regular play, the game ends and the detectives lose. The thief has a red scarf! Is it Mary or Arthur? Classic games are timeless. Great games borrow from classics without being retreads. In Outfoxed, the team at GameWright crafted a clever, unique, cooperative spin on Guess Who. Every time I played this with my little ones I recalled staring over those goofy looking faces, snapping down the people who didn’t match the questions I was asking my opponent. When I inserted a clue into the decoder, I found myself putting into words exactly the questions I would ask my opponent about their characters so many years ago. However, despite using this same binary attribute mechanic, Outfoxed still felt fresh and interesting. 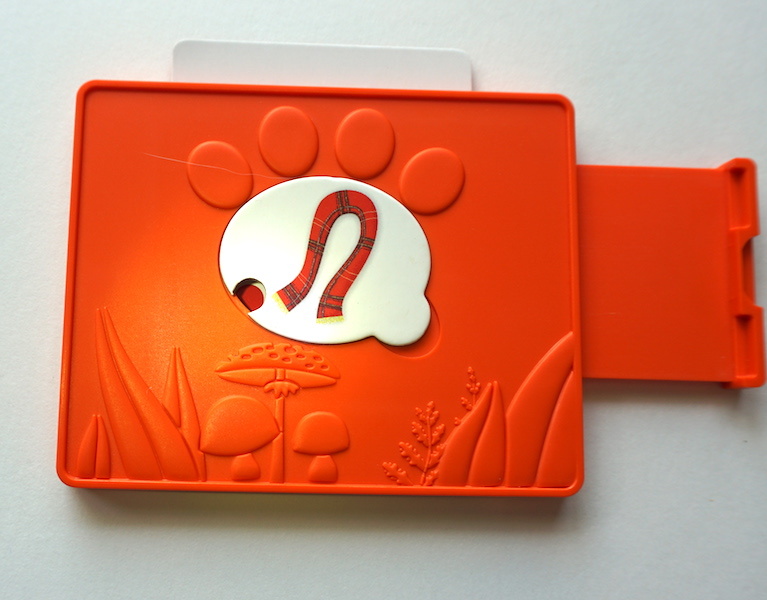 The clue decoder is a brilliant piece of tactile workmanship, creating a small rush of excitement for a child every time they get to open the window and see something new again. Outfoxed is easily variable, with the fox pawn movement being the fastest way to adjust the difficulty of the game. Beating it soundly every time? Make the fox move five spaces when the dice don’t come up the way you want them to, instead. My biggest issue with Outfoxed was actually with the color choices in the clue decoder. In my head, green means success and should associate a positive with the clue in question. However, the creators configured these the opposite way, and that always gives me pause. There are some other children’s games that scale better for adults; I played Outfoxed with some adults and it was very easy to the point of being more of an exercise than a game. Nonetheless, Outfoxed is targeted to the 5+ demographic and it excels at being a simple game with no reading that absolutely makes kids excited to play. In this, GameWright has a smashing success. The component quality is excellent, as we expect from a GameWright game. The art is whimsical and endearing, and the plot is innocent as can be. Though it doesn’t quite have the multi-generational appeal, we find Outfoxed to be outrageously fun. You can get Outfoxed right here for less than $15. It makes an amazing gift, too. Don’t wait!